Thermal insulation in buildings is an important factor to achieving thermal comfort for its occupants. Insulation reduces unwanted heat loss or gain and can decrease the energy demands of heating and cooling systems. It does not necessarily deal with issues of adequate ventilation and may or may not affect the level of sound insulation. In a narrow sense insulation can just refer to the insulation materials employed to slow heat loss, such as: cellulose, glass wool, rock wool, polystyrene, urethane foam, vermiculite, perlite, wood fibre, plant fibre (cannabis, flax, cotton, cork, etc. ), recycled cotton denim, plant straw, animal fibre (sheep's wool), cement, and earth or soil, Reflective Insulation (also known as Radiant Barrier) but it can also involve a range of designs and techniques to address the main modes of heat transfer - conduction, radiation and convection materials. Many of the materials in this list deal with heat conduction and convection by the simple expedient of trapping large amounts of air (or other gas) in a way that results in a material that employs the low thermal conductivity of small pockets of gas, rather than the much higher conductivity of typical solids. (A similar gas-trapping principle is used in animal hair, down feathers, and in air-containing insulating fabrics). The effectiveness of Reflective Insulation (Radiant Barrier) is commonly evaluated by the Reflectivity (Emittance) of the surface with airspace facing to the heat source. The effectiveness of bulk insulation is commonly evaluated by its R-value, of which there are two - metric (SI) and US customary, the former being 0.176 times the latter. For attics, it is recommended that it should be at least R-38 (US customary, R-6.7 metric). However, an R-value does not take into account the quality of construction or local environmental factors for each building. 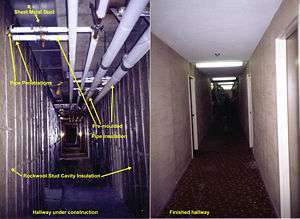 Construction quality issues include inadequate vapor barriers, and problems with draft-proofing. In addition, the properties and density of the insulation material itself is critical. How much insulation a house should have depends on building design, climate, energy costs, budget, and personal preference. Regional climates make for different requirements. Building codes specify only the bare minimum; insulating beyond what the code requires is often recommended . To determine whether you should add insulation, you first need to find out how much insulation you already have in your home and where. A qualified home energy auditor will include an insulation check as a routine part of a whole-house energy audit. However, you can sometimes perform a self-assessment in certain areas of the home, such as attics. Here, a visual inspection, along with use of a ruler, can give you a sense of whether you may benefit from additional insulation. In Russia the luxury of cheap gas has led to poorly insulated, overheated and inefficient consumers of energy. The Russian Center for Energy Efficiency found that Russian buildings are either over- or under-heated, and often consume up to fifty percent more heat and hot water than needed. Fifty-three percent of all carbon dioxide (CO2) emissions in Russia are produced through heating and generating electricity for buildings. However, greenhouse gas emissions from the former Soviet Bloc are still below their 1990 levels. In cold conditions, the main aim is to reduce heat flow out of the building. The components of the building envelope - windows, doors, roofs, walls, and air infiltration barriers - are all important sources of heat loss; in an otherwise well insulated home, windows will then become an important source of heat transfer. The resistance to conducted heat loss for standard glazing corresponds to an R-value of about 0.17 m2Ko/W (compared to 2-4 m2Ko/W for glass wool batts). Losses can be reduced by good weatherisation, bulk insulation, and minimising the amount of non-insulative (particularly non-solar facing) glazing. Indoor thermal radiation can also be a disadvantage with spectrally selective (low-e, low-emissivity) glazing. Some insulated glazing systems can double to triple R values. In hot conditions, the greatest source of heat energy is solar radiation. This can enter buildings directly through windows or it can heat the building shell to a higher temperature than the ambient, increasing the heat transfer through the building envelope. The Solar Heat Gain Co-efficient (SHGC) (a measure of solar heat transmittance) of standard single glazing can be around 78-85%. Solar gain can be reduced by adequate shading from the sun, light coloured roofing, spectrally selective (heat-reflective) paints and coatings and various types of insulation for the rest of the envelope. Specially coated glazing can reduce SHGC to around 10%. Radiant barriers are highly effective for attic spaces in hot climates. In this application, they are much more effective in hot climates than cold climates. For downward heat flow, convection is weak and radiation dominates heat transfer across an air space. Radiant barriers must face an adequate air-gap to be effective. Optimal placement of building elements (e.g. windows, doors, heaters) can play a significant role in insulation by considering the impact of solar radiation on the building and the prevailing breezes. Reflective laminates can help reduce passive solar heat in pole barns, garages, and metal buildings. Radiant barriers work in conjunction with an air space to reduce radiant heat transfer across the air space. Radiant or reflective insulation reflects heat instead of either absorbing it or letting it pass through. Radiant barriers are often seen used in reducing downward heat flow, because upward heat flow tends to be dominated by convection. This means that for attics, ceilings, and roofs, they are most effective in hot climates. They also have a role in reducing heat losses in cool climates. However, much greater insulation can be achieved through the addition of bulk insulators (see above). Some radiant barriers are spectrally selective and will preferentially reduce the flow of infra-red radiation in comparison to other wavelengths. For instance low-emissivity (low-e) windows will transmit light and short-wave infra-red energy into a building but reflect back the long-wave infra-red radiation generated by interior furnishings. Similarly, special heat-reflective paints are able to reflect more heat than visible light, or vice versa. Eco-friendly insulation is a term used for insulating products with limited environmental impact. The commonly accepted approach to determine whether or not an insulation products, but in fact any product or service is eco-friendly is by doing a life-cycle assessment (LCA). A number of studies compared the environmental impact of insulation materials in their application. The comparison shows that most important is the insulation value of the product meeting the technical requirements for the application. Only in a second order step a differentiation between materials becomes relevant. The report commissioned by the Belgian government to VITO is a good example of such a study. A valuable way to graphically represent such results is by a spider diagram. ↑ Sir Home Green Tips Archived February 9, 2013, at the Wayback Machine. ↑ "Attic Insulation | How Much Do I Need?". insulationinstitute.org. Retrieved 2016-04-26. ↑ "Archived copy". Archived from the original on 2010-06-05. Retrieved 2010-01-18. ↑ Reduce Your Heating Bills This Winter - Overlooked Sources of Heat Loss in the Home Archived November 7, 2006, at the Wayback Machine. ↑ "Archived copy" (PDF). Archived from the original (PDF) on 2007-08-29. Retrieved 2007-12-23. ↑ Windows Energy Ratings Scheme - WERS Archived January 20, 2008, at the Wayback Machine. ↑ BERC - Airtightness Archived August 28, 2010, at the Wayback Machine. ↑ V-E Framing Archived November 28, 2007, at the Wayback Machine. ↑ "Archived copy". Archived from the original on 2011-01-09. Retrieved 2010-10-25. ↑ Design of Low Cost Passive Cooling Systems, ThinkCycle Open Collaborative Design, Archived December 20, 2007, at the Wayback Machine. "Resources on the History of Insulation". solarhousehistory.com.